If you are looking to re-fight the Hundred Years War on your iPad, the game Great Battles Medieval might be for you! First released as a PC game in 2010, a new version was made available last week for users of the Apple iPad. 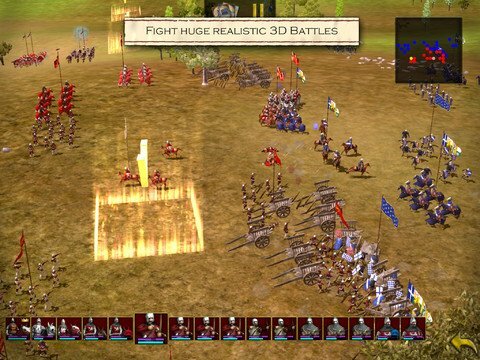 Great Battles Medieval for iPad is a blend of Role Playing Game and deep Real-Time Strategy that allows you to lead the English army during the Hundred Years War. With more than 20 different units, an almost infinite number of equipment combinations and the most detailed and realistic medieval combat model ever created, this game will excite veterans and newcomers alike. IAP’s allow you to lead the French, purchases additional mercenary units and unlock cheats. Produced Slitherine and War Drum Studios, the iPad download reached the Top 5 in the Role Playing Games chart in 39 Countries around the World, and in 21 Countries for the Strategy Games chart. It also is in the Top 10 of the overall iPad paid Apps.